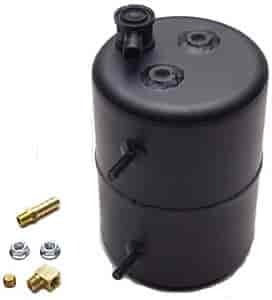 JEGS 63010 - Vacuum Reserve Canister 5" x 7"
A vacuum reserve canister captures vacuum from your engine and stores it for your power brakes. This unit approximately doubles the volume of vacuum available for your power brakes. It is recommended for cars with 14 inches of vacuum or less. Comp Cams Vacuum Canisters are made from spun aluminum, which eliminates the hazard of flaking rust particles contaminating the brake system and provides a 50% weight savings over the heavy steel cans of the past. Pump only operates when vacuum drops below 18"
5200 is rated 5.0 out of 5 by 2. Rated 5 out of 5 by SS4825 from As advertised. Excellent fit and finish. Small enough to be easily hidden on my Stock Appearing car. Rated 5 out of 5 by Hardly Davidson from Well constructed canister! Used this on my 1950 Chevrolet pickup with radical cam SBC. It did the trick in giving me a bit more stored vacuum for braking purposes!